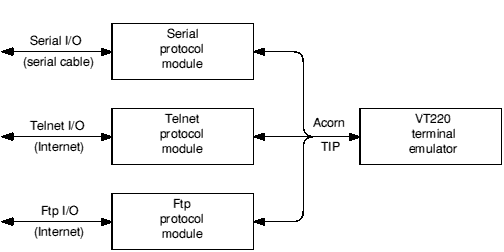 This appendix describes version 1.00 of the Acorn Terminal Interface Protocol (or Acorn TIP) used to communicate between a terminal emulator and a protocol module. By using this protocol you can integrate your own terminal emulators and protocol modules with those provided by the TCP/IP Protocol Suite. Although this chapter only talks about the Acorn TIP in the context of terminal emulators and protocol modules, there's no reason why you shouldn't use it for other applications that involve input and output. Data passing between a terminal emulator and a protocol module uses the Acorn TIP, and passes over a logical link. These are grey in the drawing above. Data passing between a protocol module and a remote machine or process uses whatever protocol the module is designed to support, and passes over a connection. These are black in the drawing above. If you decide to write other protocol modules and/or terminal emulators, you should use the Acorn TIP. Since this provides a standard interface between protocol modules and terminal emulators, users will be able to use your modules and emulators with the TCP/IP ones, and with ones that other programmers write too. If your software is compatible, we think it's more likely users will buy it. If you're writing a protocol module, you must first familiarise yourself with how a RISC OS relocatable module works. You'll find full details of this in the Modules. Your protocol module must conform to the standards laid out in that chapter. You must support the service calls detailed in this chapter. You must also support various SWIs from the set detailed in this chapter. These must be at the defined offsets from your module's SWI base number, which is allocated by Acorn. To support many of these SWIs you will need to send suitable commands over the physical connection to the remote host. The three strings are all null-terminated, and have a maximum length of 30 characters. For more details see Protocol_OpenLogicalLink (Offset 0). For more details see Protocol_OpenConnection (Offset 3). All protocol modules must (if physically possible) support multiple logical links, and multiple connections. If you're writing a terminal emulator there are various functions that it's likely you'll want it to support. This section tells you which SWIs you'll need to use for many such functions, and outlines how to use them. The later section that details each SWI will give you the detailed information you need. To find what protocols are available and compatible with the needs of your emulator, you must repeatedly issue Service_FindProtocols until it is not claimed. Then you must issue Service_FindProtocolsEnd. For your user to choose a protocol, you'll probably want to give them a menu of the ones you found to be available. Once they've made the choice, you can then issue Service_ProtocolNameToNumber to find the base SWI number of their chosen protocol module. You can then use this base number to call the SWI Protocol_OpenLogicalLink, since its offset from the base number you just found is zero. You can also use the facilities outlined in the Protocol modules and the Wimp section to provide menus so that your user can set up the way the protocol and connection will work. To open a connection, call Protocol_OpenConnection. Sometimes the protocol module won't immediately be able to open the connection; you'll need to use Protocol_GetLinkState to find out whether the connection eventually makes or fails. To close a connection, call Protocol_CloseConnection. To close a logical link, call Protocol_CloseLogicalLink; this also closes any associated connections. When you open a connection, you set the address of a poll word. The protocol module sets bits in this word when it needs attention. It's vital that your emulator regularly examines this word so that the protocol module gets adequate service. We suggest you do so each time you get a null event from Wimp_Poll. To send data, call Protocol_TransmitData. When the protocol module receives data over a connection, it will notify your emulator by setting a bit in the poll word. To get the data forwarded to your emulator, call Protocol_DataRequest. To send a file, call Protocol_SendFile to give details of the file to the protocol module. When the protocol module shows it is ready for you to send the file (by using the poll word), send the file in one or more data packets by repeatedly calling Protocol_SendFileData. Finally, call Protocol_SendFileData a last time to mark the end of the file transfer. You can use this call to send multiple files. Wherever possible you should make sure that the data packets are small enough that they can be quickly sent, so your emulator doesn't hog the computer for long periods. When the protocol module receives a file over a connection, it will notify your emulator by setting a bit in the poll word. To get the file forwarded to your emulator, call Protocol_GetFileInfo to get details of the file. When the protocol module shows it is ready to forward the file (again by using the poll word), call Protocol_GetFileData until you've received all the data packets making up the file. To explicitly get a file, call Protocol_GetFile. You'll actually receive it just as we outlined above. To abort any file operation, call Protocol_AbortTransfer. There are no SWIs specified in the Acorn TIP to send, receive or get entire directories in one call. Instead we provide a single SWI call - Protocol_DirOp - with which you can create a directory, move into a directory, and move one level up a directory tree. You can combine this SWI with the ones outlined above to move around a remote file system, creating directories, and sending and getting files at will (subject, of course, to your having access rights). The Acorn TIP provides several calls which help interaction between the Wimp and protocol menus. These are necessary because the 'pick and mix' nature of protocol modules and terminal emulators means you'll have to combine menus from each; and because protocol modules are not foreground tasks, and so don't receive notice of menu selections and Wimp events. To get a protocol's menu tree, call Protocol_GetProtocolMenu; you can then combine it with your emulator's menu tree. If a user clicks on the protocol module's part of the menu tree, call Protocol_MenuItemSelected to pass this on. To pass on a Wimp event to a protocol module, call Protocol_UnknownEvent; you should do this for every event your emulator can't deal with, as the protocol module may be able to. Finally, you can generate a Break over the connection by calling Protocol_Break. What your terminal emulator should do before calling the Service Call or SWI. What a protocol module should do when it receives the Service Call or SWI. What your terminal emulator should do when the call returns to it. We've followed the same viewpoint throughout as we have above: we assume that you're writing a terminal emulator to work with someone else's protocol module. So we talk about your terminal emulator, but the protocol module. If, in fact, you're writing a protocol module, you should find it easy enough to make the necessary shift of viewpoint. Repeatedly issue this service call until it is not claimed - without polling the Wimp in the meantime. Issue Service_FindProtocolsEnd (see Service_FindProtocolsEnd (Service Call &41581)). All other bits are reserved and must be zero. it supports links in the direction required by the terminal emulator. If one of the above isn't true, the protocol module must not claim the call - that is, it must return with registers preserved. If both the above are true it must claim the call - that is, it must return with the values shown above in the On exit. It must then set an internal flag so it doesn't claim this call again until it receives a Service_FindProtocolsEnd. The three strings are all null-terminated, and have a maximum length of 30 characters. The protocol module must always keep this block updated so terminal emulators can directly access it. If the protocol is mainly for file transfer (such as Ftp) and the terminal emulator doesn't support file transfer calls (bit 0 of R3 was clear on entry) the protocol module should set bit 0 to show it's 'not useful'. Use this service call in your terminal emulator to indicate the end of your search for available protocols. Protocol modules must change their internal flag so they respond again to Service_FindProtocols calls - from whatever terminal emulator the calls originate. They must not claim this call. Use this service call in your terminal emulator to request the conversion of a protocol name to a base SWI number. If a protocol module recognises the protocol name it must claim the call and return the base SWI number of the protocol. Otherwise it must pass the call on. Use this call in your terminal emulator to open a logical link to a protocol module. The handle you pass on entry will be returned to you by future SWI calls you make to the protocol module - we suggest you use a pointer to your data structures that are specific to this link. You may use the terminal identifier string for such things as setting the 'type' of your terminal emulator on the remote machine. The protocol module returns its own handle for the link - again this is typically a pointer to its own data that is specific to the link. The Wimp_Poll mask it returns specifies those Wimp events that it doesn't need. When this call returns to your terminal emulator you should examine bit 0 of the protocol information flags. If it is clear then you should immediately call Protocol_OpenConnection; if it is set you will have to wait until the user shows they are ready to supply the information the protocol module needs (by, for instance, moving the pointer over the arrow that shows an 'open connection' menu item to have a submenu). Also, you should AND the protocol module's Wimp_Poll mask with your terminal emulator's own one. Use the resultant mask whenever you call Wimp_Poll. Use this call in your terminal emulator to close a logical link to a protocol module. The protocol module closes any connections that are associated with the logical link. Use this call in your terminal emulator to get a protocol's menu tree. You must use this call each time you want to open the protocol's menu, as it may change depending on the state of the logical link. For example items may become unavailable and so be greyed out, or the user may change the contents of a writable entry. The protocol module returns a pointer to a menu block that is the same as that used by Wimp_CreateMenu. (See Wimp_CreateMenu for details of this call.) This menu block must accurately reflect the current state of the logical link between the terminal emulator and the protocol module. Use this call in your terminal emulator to open a connection from a protocol module. At the same time you pass the protocol module the address of a poll word in your workspace, which your terminal emulator must regularly check to review the state of the logical link to the protocol module. We suggest you do so each time you get a null event from Wimp_Poll. When a bit is set in the poll word, something needs attention. The table below shows the meaning of each bit, and the initial SWI call you have to make to handle the situation. See the relevant pages for details of what to do, and of any further calls you may need to make. The poll word must be in RMA space, so the protocol module can update it whether or not your terminal emulator is the foreground task. If the protocol module needs no further information to open the connection these values are ignored. If the user has shown they are ready to supply the information the protocol module needs (typically by moving the pointer over the arrow that shows an 'open connection' menu item to have a submenu), you must set R3 to zero, and R4 and R5 to the coordinates where you want the protocol module to open a dialogue box. You can get these coordinates by making your terminal emulator's menu issue Message_MenuWarning when the submenu is to be activated (see Wimp_CreateMenu on Wimp_CreateMenu and Wimp_SendMessage on Wimp_SendMessage). If the user has already supplied you with the information that the protocol module needs (say in a script) you should pass that in R3. The values of R4 and R5 are ignored. The protocol module opens the connection after first (if necessary) using a dialogue box to get any information it needs. The documentation of a protocol module must state the format of information it expects to find in R3 (if it needs any). Wherever possible, this format should consist of the same fields that the protocol module provides in its dialogue box, in the same order, and comma-separated. All other bits are reserved and must be zero. The protocol module should select 'connection failed' in preference to 'no connection opened'. If the connection failed (bits 0 and 1 are set) and no data is pending (bit 2 is clear) you must attempt to close the connection by calling Protocol_CloseConnection. If the connection is pending you must wait until bit 0 of the logical link's poll word is set. Then you should call Protocol_GetLinkState to find if the connection was opened, or if it failed. Bit 2 ('data pending') has exactly the same meaning as bit 0 of a logical link's poll word, and is provided to reduce the amount of polling that needs to be done. If it is set you should initiate the data transfer by calling Protocol_DataRequest. Use this call in your terminal emulator to close a link's connection from a protocol module. The protocol module closes the connection associated with the given link. Use this call in your terminal emulator to transmit data over a connection via a protocol module. You'll also receive any pending data that the protocol module has been holding for you. All other bits are reserved and must be zero. If the transmitted data is in words, each word contains one character in the least significant byte. The protocol module transmits the data over the connection. Also, if it has any pending data for the terminal emulator it forwards as much as it is able to place in the emulator's receive buffer. The protocol specific information it returns may be used for error messages. If the connection is pending you have made an error in your programming by trying to use the connection before it has been properly opened. Bit 2 ('more data pending') has exactly the same meaning as bit 0 of a logical link's poll word, and is provided to reduce the amount of polling that needs to be done. If it is set you should initiate the data transfer by calling Protocol_DataRequest. If the data you've received is in words, each word contains one character in the least significant byte. if the 'data pending' bit (commonly bit 2) of the protocol status flags (commonly in R3) is set on return from a Protocol... SWI call. The protocol module forwards as much of the pending data as it is able to place in the emulator's receive buffer. Bit 2 ('data pending') has exactly the same meaning as bit 0 of a logical link's poll word, and is provided to reduce the amount of polling that needs to be done. If it is set you should continue the data transfer by calling Protocol_DataRequest. If the data is in words, each word contains one character in the least significant byte. The protocol module services the menu selection, either doing what the user clicked over, or displaying the necessary submenu. Use this call in your terminal emulator to pass on Wimp events you can't deal with to the protocol module you're using. You should also pass on idle events if the protocol module's Wimp_Poll mask (see Protocol_OpenLogicalLink) doesn't mask them out - even if your terminal emulator uses them. The protocol module processes the Wimp event if it is one in which it is interested. Use this call in your terminal emulator to get the state of a logical link. One time you should do so is if an attempt you've made to open a connection has resulted in a pending connection. You should then wait for bit 0 of the logical link's poll word ('data pending') to be set before making this call to find if the connection was opened, or if it failed. If the connection is pending you must wait until bit 0 of the logical link's poll word is set. Then you should call either Protocol_DataRequest or Protocol_GetLinkState to find if the connection was opened, or if it failed. Use this call in your terminal emulator to force a protocol module to generate a Break. The protocol module generates a Break. The precise interpretation of this varies from module to module. The documentation of a protocol module must state how it interprets this call. Use this call in your terminal emulator to initiate sending a file over a protocol module's connection. The protocol module must ready itself to accept the file over the terminal emulator's logical link, and to send it over the connection that is associated with the link. When it is ready it must show this by setting bit 2 of the link's poll word. If bit 1 of the emulator send flags is set (a multiple file transfer) and the protocol module uses dialogue box(es) to show the state of the transfer, it must use the same box(es) for each file in turn, rather than using a new one for each file. If the connection failed (bits 0 and 1 are set) and no data is pending (bit 2 of the link's poll word is clear) you must attempt to close the connection by calling Protocol_CloseConnection. When you start a file transfer with this call the link is in a paused state. You should wait for bit 2 of the link's poll word to be set before you try to resume the transfer by calling Protocol_SendFileData (see the next page). Use this call in your terminal emulator to send the data in a file over a protocol module's connection. You can (if necessary) split the file into separate data packets and repeatedly use this call to transmit each packet. You must not set both these bits at once, so a file transfer must end with two calls of this SWI: the first with bit 0 set (EOF), the second with bit 1 set (end of file transfer). The protocol module sends the file over the connection that is associated with the link. If it has to pause the transfer it must show when it is ready to resume by setting bit 2 of the link's poll word. If the connection failed (bits 0 and 1 are set) and the transfer is not paused (bits 2-3 do not have the value 01) you must attempt to close the connection by calling Protocol_CloseConnection. If the transfer is paused (bits 2-3 have the value 01) you must wait for bit 2 of the link's poll word to be set before making this call again to continue the transfer. Use this call in your terminal emulator to abort a file transfer. The protocol module aborts the transfer and makes sure that the connection associated with the link is ready for other use. if bit 1 ('file pending') of the link's poll word is set. This will usually be as a result of your calling Protocol_GetFile to request that the file be sent. The protocol module returns details of the file to the terminal emulator. When this call returns to your terminal emulator you must use these details to get ready to receive the file, before calling Protocol_GetFileData to actually get the data. Use this call in your terminal emulator to request that a protocol module forwards the data in a file. The protocol module must forward the file data to the terminal emulator. It can (if necessary) split the file into separate data packets, pausing the transfer after each packet. If so, it must show when it is ready to forward the next packet by setting bit 2 of the link's poll word. Use this call in your terminal emulator to request that a protocol module sends its interactive help message for the menu entry. The menu selection array you send must be terminated by a null. The protocol module must send the appropriate help message. Use this call in your terminal emulator to request that a protocol module gets a file over a connection. The protocol module gets the necessary information to respond to a Protocol_GetFileInfo call, and the first packet of the file to respond to a Protocol_GetFileData call, before showing that it is ready by setting bit 1 ('file pending') of the link's poll word. If the connection failed (bits 0 and 1 are set) and there is no operation in progress (bits 2-3 do not have the value 01) you must attempt to close the connection by calling Protocol_CloseConnection. If the operation is still in progress (bits 2-3 have the value 01) you must wait for bit 2 of the link's poll word to be set. You can then make this call again with a null reason code to read the flags for the completed operation.